Having recently discovered kaia naturals, I tried their popular Juicy Bamboo Natural Facial Cleansing Cloths and it was love at first sight. I loved it so much, I am already on my second, which is good and bad. Good because it is my go-to, bad because I still have other cleansing wipes I need to finish up (and hoping they do not dry up). "Our cloths are harvested from unbleached bamboo natural fibres, which have a lower environmental impact than a standard wipe. The cloths are made in small batches and saturated in vitamins B12, C and E, then soaked in citrus essentials oils. Our 'secret weapon' is a nourishing blend of honey that is heated and liquefied." The cloths are also great because it acts as a 3-in-1: facial cleanser, toner, and makeup remover. Might I add, it can also remove stubborn waterproof mascara and eye makeup! There are no sulfates, parabens, alcohol and synthetic fragrance. Aren't these cleansing cloths amazing?! Like I mentioned earlier, I cannot get back to finishing my other cleansing wipes. They are just that wonderful. To top everything off, I'm reusing the containers to store my hair accessories and mini makeup samples! Winning! What are your thoughts on kaia naturals? 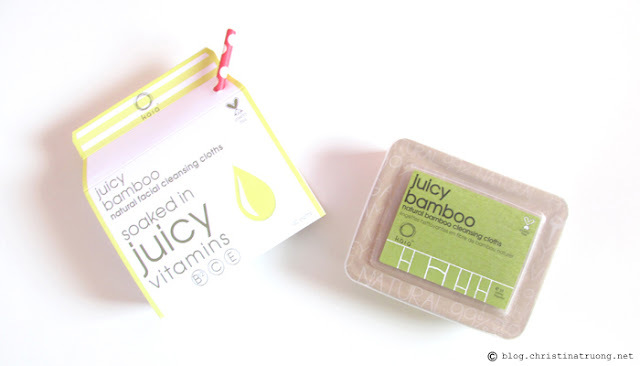 Have you tried juicy bamboo (natural facial cleansing cloths) or bamboo tapioca beads (daily exfoliator powder)?